** ADOPTED! ** Gino is 49 lbs of love and joy! This boy is outstanding – crate trained , house trained, knows sit and come, easy to handle, doesnt mind other fur friends, car rides, baths – no problem. Gino is ready to find his forever home. Gino is polite and tolerant with other respectful dogs, but has shown zero interest in a doggie playmate. He will happily play by himself, tossing toys in the air and grabbing another to repeat the fun. He will play fetch but hasn’t perfected the “leave it” (or even the “go get it”) all the time. He LOVES his kennel and enjoys making himself into a blanket burrito. Gino is ready to find his forever home. 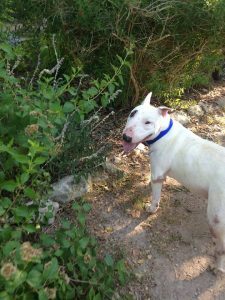 Please submit our adoption application online www.texasbullterrier.org – click on the Rescue tab – if you would like to add this boy to your family.